Last edited by DavidA; Nov-19-2018 at 00:19. Orfeo would reveal a very interesting document with the first one if the vaults of the ORF were careful enough. The RCO live performance has a respectable sound quality, according to the excerpt. Poor Birgit isn't getting much love here! 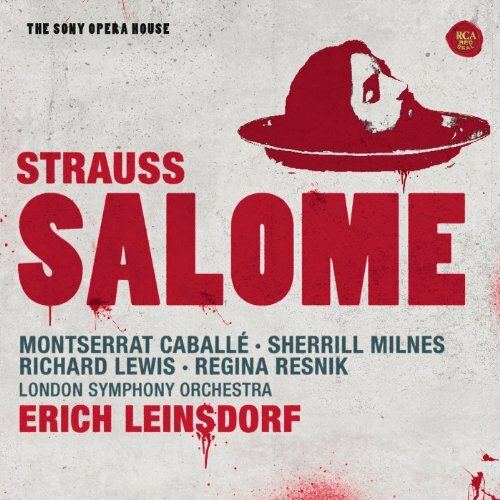 I first heard Salome in the Nilsson/Solti recording, and once I got past the outrageously campy album cover I really enjoyed the almost-as-outrageously campy opera itself. It didn't even occur to me that Birgit sounded older than sixteen. In fact, I can't say to this day how old Nilsson sounds in anything she sang; it's one of those voices, rather like certain faces (maybe even hers) with a bone structure that makes you look mature when you're young and youthful when you're old. In any case, I do think Nilsson is effective in the role and sings quite an exciting final scene. Her stainless steel valkyrie voice may not have been Strauss's ideal, but I suspect he'd have been pleased with her advocacy had she been around in his lifetime. So much of what passes for commentary about suitability for roles boils down to the reviewer's personal reaction to a particular voice. I like Nilsson; thus I find her enjoyable in a plethora of roles, from Brunnhilde to Aida to Turandot. Someone else doesn't like Nilsson, so they find her too steely to enjoy in Wagner, too cold to enjoy in Italian opera, too mature for Salome. To me, when I realize that certain commentators simply always like or always do not like a particular performer, these comments just become repetitions of the opinions, "I like listening to her" or "I don't like listening to her". Frankly, I wonder how much such value such commentary provides. Last edited by howlingfantods; Nov-18-2018 at 22:58. Mind you, you can say that about any commentary, assuming the right notes are being sung. It boils down to opinion and personal taste. To me Nilsson doesn't seem right in the role yet I don't know who else could have sing it above Solti's powerhouse orchestra and been heard. I see Wunderlich gets second billing here, but I would assume he's playing Narraboth, not Herod? I think you make a good point. People have very different ideas about what voices sound "right" in various roles and repertoire. I'm sort of in the middle with Nilsson in particular, not fond of her in most Italian rep but very comfortable with her in Wagner's and Strauss's more dramatic parts. Though her timbre is very bright and not "warm" in a conventional, Italianate way, I don't generally find her too "cold" or lacking in "femininity," and as far as sounding like a teenage girl, I would guess that as a teenage girl she sounded a lot like the singer we hear in her forties and fifties ("I always had a loud voice," she said). Is she my ideal Salome? No, but her brilliant, yet never harsh, tone and her soaring freedom in Strauss's high lying passages certainly suits the writing, and I can't fault her understanding of the part or her lively and precise declamation of the text. In a similar instance, I've seen Flagstad's superb late recording of Isolde under Furtwangler described as "matronly," with complaints that Isolde is supposed to be young. Before I read it, this thought simply never occurred to me, and I have to say that while I recognize a certain loss of ease at the top of her range (she was 57), my enjoyment of Flagstad's masterly performance is unaffected by considerations of age. Opera is full of roles representing youthful characters, and we quite routinely expect to hear them portrayed by singers who don't look or sound the age of those characters, or at least what we imagine they "should" sound like. The obvious truth is that people of all ages have all sorts of voices, and, as you say, this issue is in great degree a matter of taste. Yes, and I'm certainly not saying it *shouldn't* be a matter of taste, just that it's less useful to third parties if that taste is so strong that it is absolutely either positively or negatively uniform, no matter the individual recording, and almost obfuscatory if presented as if it's something specific to the recording. Solti is probably my first choice, but the overlooked Leinsdorf recording is also quite good. Caballe is surprisingly effective in the title role. Yes. I have never been a fan of Caballe, but she pulls a big surprise here. Her Salome is enjoyable and believable. I like Sinopoli's and this, although Malfitano's voice sounds too rush and dry. She is in much better voice conditions in the DVD with Estes, with Sinopoli. Last edited by grandebulla; Jan-26-2019 at 15:39. I don't have the recording but, seeing (Gerhard) Stolze's name there, he'll be the one playing Herod, not Wunderlich. And you would be absolutely right! It is a belter of a cast though! All times are GMT +1. The current date and time is Apr-25-2019 11:41.